Andrew Bird returns to town on Saturday to headline the Chicago Theatre—he's also one of the participants in this week's Artist on Artist, which you should go read if you haven't already. If you're hoping to make it out to some other shows this weekend you've got plenty of options. Tonight Miley Cyrus and Icona Pop swing by the United Center and Mountains for Clouds headline Township. Tomorrow night Robin Thicke will likely play the creepy tunes off Paula at the Venue at Horseshoe Casino, and Cadillac Duke, Chandler London, and Chris Crack perform at Elbo Room. On Saturday Rod Stewart plays Allstate Arena and the O'My's headline a Metro show that also features M&O and Saba. On Sunday you can see Leo Kottke at City Winery or Supersuckers at Reggie's Rock Club. Be sure to head to Soundboard to dig through all of our concert listings. Read on for more concert picks from Reader critics and listen to our weekly "Best shows to see" Spotify playlist at the bottom of this post (follow us on Spotify too). "I saw Chapel Hill band Spider Bags play in Atlanta two years ago, and their set was a blast of high-octane, country-fried garage slop—so when I heard this month's Frozen Letter, their first release on indie giant Merge, I was surprised by its sophistication and nuance," writes Luca Cimarusti. "The cowpunk element still dominates, but the record is full of dynamic, deliberate, introspective pop. Front man and guitarist Dan McGee, who's led the band through several personnel changes since its 2005 inception, sings with the impossibly smooth indifference of J Mascis, and on guitar he bounces between tastefully melodic shredding and acoustic strumming; a clean rhythm section anchors the concise, efficient tunes." "This Oregon speed-metal band took some time to reorganize after their acclaimed debut full-length, 2011's Under the Spell," writes Monica Kendrick. "In 2012 guitarist Tyler Loney switched to lead vocals, and a new drummer and second guitarist came aboard. So the five-piece that made Spellcaster's new self-titled full-length (available on CD via the Lone Fir label or as a stream or download on Bandcamp) isn't quite the same group that made Under the Spell. It might be even better: these guys have always excelled at shredding solos, and that hasn't changed, but the rhythm section is tighter and harder, which sharpens and focuses the band's crisp, classic speed metal." "Ahleuchatistas guitarist Shane Perlowin demonstrates radically different playing on two new recordings—the self-released solo acoustic album Odei and the self-titled New Atlantis debut from Blind Thorns, an aggressively electric trio with drummer Ryan Oslance and Swiss vocalist Antoine Läng," writes Peter Margasak. "Both efforts illustrate directions Perlowin has been taking his main band—lately a duo with Oslance. Ahleuchatistas once played hyperactive, instrumental math-rock, but they're now by turns more gentle, melodic, thoughtful, and broad. Perlowin makes his virtuosity obvious on Odei, contorting flamenco- and Arabic-flavored lines as well as American Primitive-style fingerpicking with a kind of post-Derek Bailey improvisational sensibility; fluid melodies crash into dissonant tangles of overtones (and vice versa). The Blind Thorns album sounds more like recent Ahleuchatistas material, except that it has Läng's outsize vocal abstractions to push it from one extreme to the next." "Brothers Sherman and Wendell Holmes (and drummer-vocalist Willie "Popsy" Dixon) got their start in gospel, which remains a dominant force in their music, but they've never been shy about mixing the secular with the sacred," writes David Whiteis. 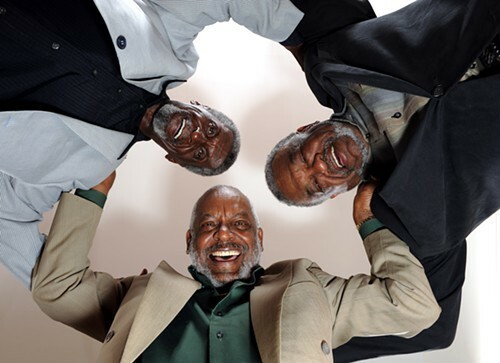 "On the Holmes Brothers' latest CD, this year's Brotherhood (Alligator), their churchy harmonies are as finely honed as ever, though age has coarsened their mellifluous voices a bit and broadened their vibrato. The songs, on the other hand, are uncompromisingly bluesy—only a few deliver a message of redemption or salvation. On 'Passing Through' and 'Lickety Split,' Wendell Holmes's neckbone-and-gristle rasp makes a perfect match for the hard-eyed lyrics; Dixon adds spiritual foreboding to the Ike Turner/Jackie Brenston vehicle 'You Got to Lose,' turning a song about rocking in the face of ruin into an irony-darkened meditation on fate and retribution."